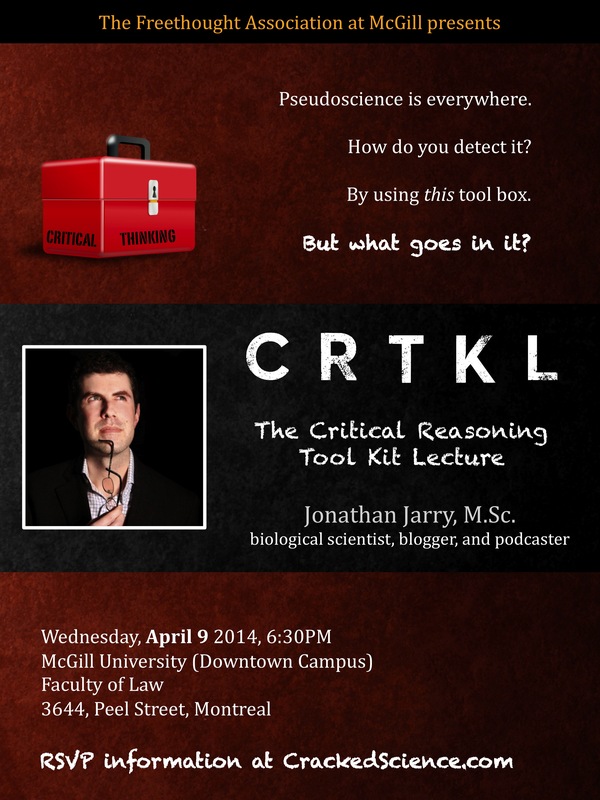 The one-hour talk I will be giving on the 9th is entitled “CRTKL: The Critical Reasoning Tool Kit Lecture”. We should all endeavour to be better critical thinkers… or should we? What are the benefits of critical thinking? Why is critical thinking so hard? And what tools do we need to become better at it? My objective is not to teach you what to think but, rather, to teach you how to think. Once we have discovered the content of this tool kit, we will look at two biomedical claims to see if they hold up to scrutiny. I promise fun, education, shocking facts, and a healthy dose of skepticism. Even better, the event is entirely free. If you have a Facebook account, type in “CRTKL Lecture” in the search bar and you will find the Facebook event for it. You can RSVP there. If you are on Meetup, an event will soon be created on the CFI Montreal page. Please only RSVP to one of these two places so the Association can get an accurate head count. You can also show up without RSVPing… you scoundrel. The talk will take place in room 101 of the Law Faculty. The address is on the poster. Tags: alternative medicine, biology, CRTKL, dilution, education, health, homeopathy, lecture, medicine, miracle cures, oscillococcinum, pseudoscience, treatment, vaccines. Bookmark the permalink.